Eden Hazard celebrates after scoring his sides third goal with his team mates during the Premier League match between Chelsea and West Bromwich Albion at Stamford Bridge on February 12, 2018 in London. Monday could be a tipping point in Chelsea’s season when they travel to Vicarage Road to take on Watford. 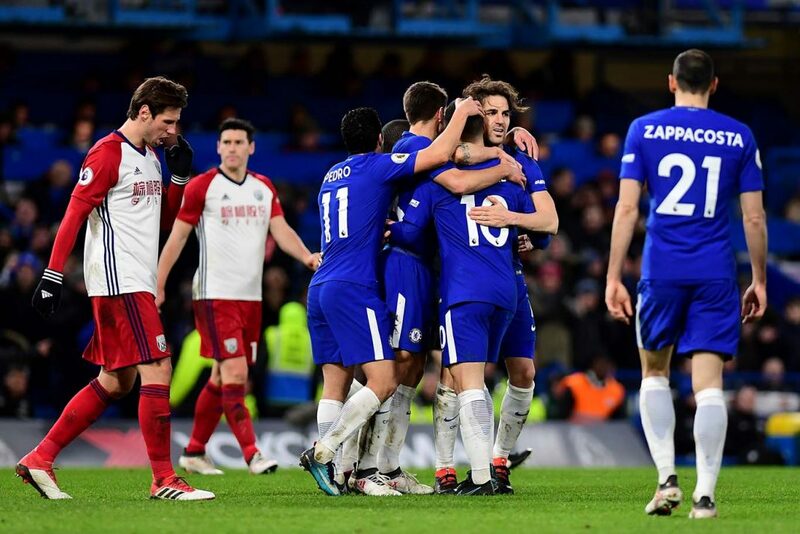 Defeat against Bournemouth last Wednesday night at Stamford Bridge has turned up the pressure on Chelsea and manager Antonio Conte, and a second straight defeat in the Premier League would only intensify that pressure. It’s not as if Chelsea have had a terrible season. The Blues have only lost seven matches this season, but three big losses to West Ham, Crystal Palace, and now Bournemouth were the result of poor performances from Conte’s side, and the Bournemouth result was particularly bad. It wasn’t just the score line, but the manner of the defeat that’s the most damning. Chelsea looked devoid of ideas in attack and fell apart defensively after Andreas Christensen limped off due to injury. With David Luiz also injured, Gary Cahill took over in the centre of the back three and clearly looked uncomfortable. Fortunately, it looks as if Luiz will be fit to play against Watford in place of Christensen who suffered a hamstring problem. Willian, who also missed the Bournemouth match, is also available, while Olivier Giroud is likely to make his Chelsea debut from the bench. The good thing for Chelsea is that Watford have not had the greatest run of form as of late. The Hornets started the season well but have fallen away in recent months, which some believe is due to a lack of focus after Marco Silva openly admitted he’d be willing to become the manager of Everton after Ronald Koeman’s sacking. Silva is no longer in charge, and it’s now Javi Gracia’s job. Gracia hasn’t had the best start, losing to Southampton in the FA Cup and drawing against Stoke in the Premier League, but Watford’s performances have been better, and they’ll be hungry for a signature victory against Chelsea at home. It’s a very dangerous match for Chelsea. Watford possess a number of powerful midfielders who can also get forward to support an attack, and they have tricky players in Roberto Pereyra and Richarlison who can create chances. Chelsea have looked a little sluggish in recent weeks, and Watford have the tools to make them pay. If Chelsea should lose this match, their next match comes against West Bromwich Albion in a week’s time. There would be plenty of time to discuss the direction of the club for the rest of the season.